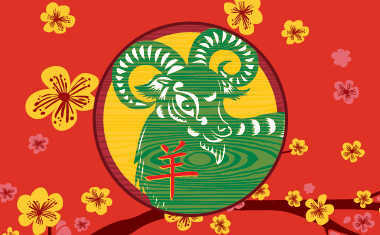 The Chinese Year of the Green Wood Sheep (also known as the Year of the Goat) which begins on February 19, 2015, brings different gifts of love to each Chinese sign. The Sheep is an animal associated with calm and tranquility, so relationships can benefit from this peaceful energy. Look up your free Cosmic Profile to see all seven of your signs! The Year of the Green Wood Sheep is an ideal time for The Rat to start a family. "Be fruitful and multiply" will be this industrious sign's motto for 2015. Rats that have no desire for children could find a playful romantic partner while taking a class, attending a professional conference or traveling abroad. The best bet for the Rat to find love is to step out of its comfort zone. Rats in committed relationships could experience a second honeymoon phase during this highly passionate year. 2015 will bring stability to the Ox's love life. Committed relationships should be pleasant but uneventful. Therefore, couples seeking greater financial security would be wise to purchase a home, start a retirement account or set money aside for their children. Single Oxen should take this opportunity to play the field. Serious commitments aren't favored in The Year of the Green Wood Sheep. Casual dating is preferred during this fun-loving year. This confident sign will attract a steady stream of admirers and never lack for companionship. Tigers should be wary of love during The Year of the Green Sheep. Someone who seems utterly charming on the first date could later be revealed as deeply troubled. Instead of jumping head first into a relationship, it would be best for the impulsive Tiger to take things slowly with love interests. Members of this sign who are in committed relationships should set aside regular date nights with their partners. It's easy for the Tiger to get bored during a Sheep Year, so staying connected is critical. The Rabbit is a virtual love magnet during 2015. Whether single or attached, this gracious sign will have lots of fun dating, mating and relating. A Rabbit looking for love could easily meet their soul mate during the Year of the Sheep. 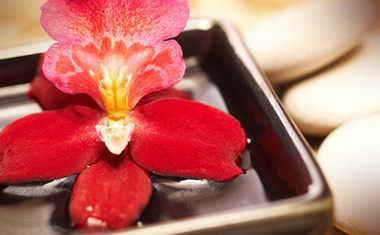 Artistic gatherings are especially favored for romantic encounters. Therefore, it would be wise for single Rabbits to attend as many movies, concerts, dances and plays as possible. Rabbits in committed relationships may enjoy creative collaborations with their lovers. Engagements and weddings are favored. Emotions will be running high in the Dragon's love life. Members of this sign who are in relationships will be tested. Their partners will engage in behavior that is often bewildering. If this principled sign decides to stay loyal, their union will last a lifetime. If the Dragon chooses to break up, it will take time to heal. Bed hopping is not advised during The Year of the Green Wood Sheep. It will be easy for single Dragons to fall head-over-heels in love in 2015. The single Snake would be wise to take a cautious approach to love this year. Finding Prince or Princess Charming will be a slow process. The Year of the Sheep tends to highlight people's best qualities and mask their troubling traits. Therefore, the calculating Snake needs to be especially discerning when getting engaged or married. Members of this sign who are in relationships could become victims of jealousy. 2015 will be filled with lots of fun parties, putting inconstant lovers in the path of temptation. It will be difficult for the Horse to make a romantic commitment in the Year of the Green Wood Sheep. Admirers will surround single members of this sign. All this variety could prove bewildering. When it comes to settling down, it would be best for the Horse to trust its heart over its head. 2015 invites this analytical sign to trust their instincts. Any Horse in a committed relationship will have lots of fun with their romantic partner. A second honeymoon is strongly favored now. The Year of the Green Sheep will shower love, adventure and excitement onto the lucky members of its own sign. Committed Sheep may decide to conceive or adopt a child, leading to great happiness. Single Sheep could meet soul mates through artistic endeavors. Any member of this imaginative sign seeking a partner should pour their energy into painting, writing, sculpting, playing music and creating works of art. The fruits of their labors will attract admires in droves. Engagements and weddings will be common for Sheep. 2015 will be an incredibly romantic year for the lively Monkey. Single members of this sign may finally be compelled to settle down with an irresistible partner. Monkeys who are in committed relationships will gain strength from their partners. A raise, promotion or high-powered job may be awarded to the Monkey's mate, paving the way for a secure financial future together. Members of this sign should be open to relocating for the sake of their mates. Sheep years reap considerable rewards for married Monkeys. The Year of the Green Wood Sheep invites single Roosters to settle down. Members of this restless sign would be wise to commit to a partner that is their intellectual equal. Getting engaged or married in 2015 could be the smartest decision the Rooster will ever make. If this sign is in a serious relationship, kindness and consideration are critical. Any Rooster who puts its partner first will be rewarded with loyalty and gratitude. A troubled relationship could be healed during this therapeutic year. Love will be the primary focus for the loyal Dog in 2015. 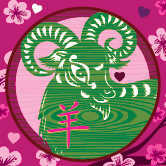 The Year of the Green Wood Sheep is an ideal time for this sign to get engaged or married. Finding the perfect partner will be easy, particularly if the Dog indulges its love of philanthropy. Meeting their soul mate at a fundraiser is a strong possibility. Members of this sign who have partners will be pampered and petted. These Dogs should be open to receiving the affection they freely give to others. The sociable Pig will find plenty of opportunities for love in The Year of the Green Wood Sheep. Single members of this sign should enjoy playing the field. Making a serious commitment could be a mistake. This year, it's easy for Pigs to mistake having fun for being in love. Postpone an engagement or marriage for 2016. Pigs who have committed partners should exercise their independence this year. Too much togetherness can be suffocating this year. Separate vacations can actually strengthen a romantic bond. Prepare for the Year of the Wood Sheep with a personalized 9-Star Ki Forecast.